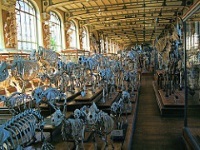 Located in the Jardin des Plantes, the Musée National d'Histoire Naturelle (Natural History Museum) greets visitors with two gigantic whale skeletons at the entrance. With wonderful exhibitions and fascinating displays on botany, archaeology and palaeontology, the museum will captivate kids' imaginations and educate them as well. The dinosaur exhibit is hugely popular with the younger visitors, but this museum is a must for children of all ages. The museum is large and actually combines three museums into one (sometimes they are listed independently), including a four-story taxonomy wing called the Hall of Evolution, a gallery dedicated to palaeontology - the study of fossils, including the beloved dinosaur exhibit - and a separate building devoted entirely to mineralogy. You can choose to visit only one of these three museums. There is plenty to enthral little ones (and grown up ones) and the fact that the museum feels a little old-fashioned actually adds to its charm. Opening times: Wednesday to Monday 10am-6pm. Closed Tuesday and some French holidays. Admission: Admission costs vary depending on which exhibitions visitors want to see. Check the website for details.